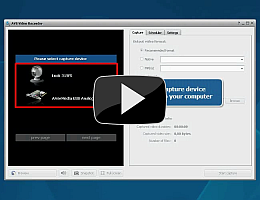 AVS Video Recorder is a special separate utility that enables you to trasnfer video from any video capture device connected to your computer and save it on hard disk drive. encode video directly to MPEG-2 instead of native hardware uncompressed video format and save free space on your computer. To start AVS Video Recorder go to Start menu and choose All Programs -> AVS4YOU -> Video -> AVS Video Recorder.